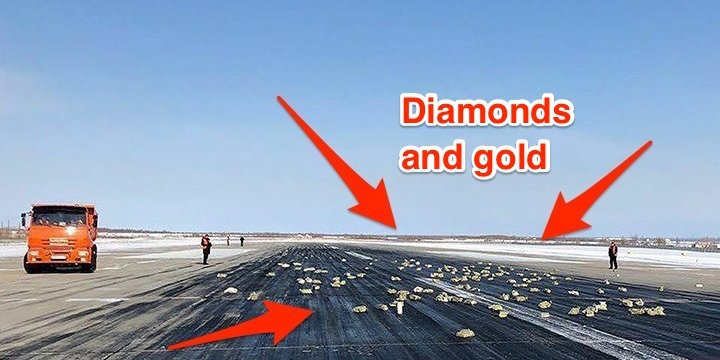 Imagine for a moment that you live in Siberia, one of the most hellish regions on earth, and one day gold bars and diamonds shower down from the skies! The precious metals rain down as you watch. You think your ship has come in! God has granted your wish for good fortune. Unfortunately, it wasn't God showering you with enough wealth to take care of generations of your children. It was a Russian airplane - a Nimbus Airlines AN-12 - that was scattering the riches across the countryside! But before you can start scavenging, government authorities appear. 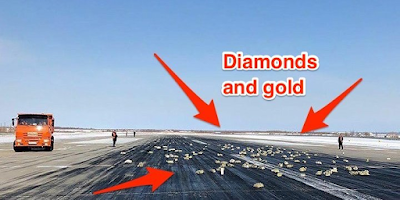 The Siberian Times reported that the value of "gold, platinum and diamonds" aboard the aircraft totaled $368 million. Apparently some moron didn't secure the hatch door after the plane took off. Oh, well.